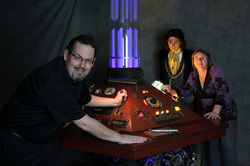 Shaun Collins is an international award-winning writer, director, podcaster, blogger, radio host, movie reviewer, sometimes actor, student, ner-do-well and the owner of SunStorm Entertainment, a Topeka based production company for his flights of fancy. These are some of the creative brain drippings that ooze from between his ears. Do you have a convention or event you would like me to attend? Do you have a panel you would like me to be on? Please email me at robert_sunstorm@yahoo.com and we'll talk! Or leave your information below!